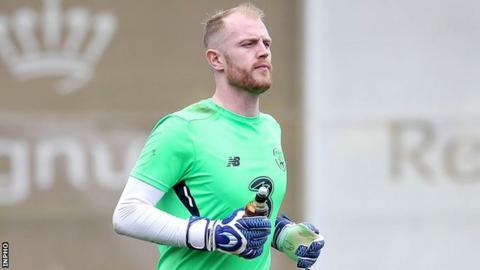 Premiership strugglers Warrenpoint Town have signed goalkeeper Aaron McCarey from Scottish side Ross County. The 26-year-old, who was in the Republic of Ireland squad for March's friendly with Turkey, started his career with Monaghan United. McCarey's previous clubs also include Wolverhampton Wanderers, Wallsall, York City, Portsmouth and Bury. "He will certainly add huge experience to our panel," said Warrenpoint manager Stephen McDonnell. The Monaghan-born player has represented the Republic of Ireland at youth level. McCarey made the Monaghan team as a 17-year-old and established himself as the League of Ireland First Division club's first-choice goalkeeper before moving to Wolves in 2010. He added: "Personally, myself and Aaron go back to our underage playing days together with Dundalk SBL and international teams, so it's great to be back working together again." McCarey's arrival is a much-needed boost for Warrenpoint, who are bottom of the table after losing all five league games.